Robert Pappas is an independent filmmaker currently in the final stage of updating his film To Age or Not to Age. This is a film on longevity research featuring interviews with prominent researchers. Two days ago, Robert asked me to generate a short presentation on my own pet theory for extraordinary longevity for inclusion in the film. This is the Closing the loop in the stem cell supply chain theory described in the blog entries The stem cell supply chain – closing the loop for very long lives , Progress in closing the stem cell supply chain loop, and mentioned in several others. The presentation had to be simple and suitable for non-technical viewers and was needed immediately. It will be shown on Dish TV and will likely be exposed to a couple of million viewers. I prepared the presentation yesterday and for that purpose I created two explanatory graphics. For the benefit of my less-technical readers I present the graphics and more or less the same explanation here, though not quite as simplified for the film and with some hyperlinked references. The first diagram is a simplified explanation of how cells relate to one another in the course of a normal lifetime. At CONCEPTION of fertilization (upper left corner) the GERMLINE CELLS, sperm from father and egg from mother come together to form an embryo containing at a very early stage EMBRYONIC STEM CELLS. These are pluripotent cells, which means they are capable of eventually differentiating into all of the body’s some 200 different types of cells (blood cells, nerve cells, heart cells, skin cells, etc.). During EMBRYONIC DEVELOPMENT this cell differentiation occurs. In this simplified description three categories of cells are produced: ADULT STEM CELLS, PROGENITOR CELLS and SOMATIC BODY CELLS. These categories of cells will be around the rest of our lives although the specific cells in them will continue to change due to cell division, cell death and, except for adult stem cells, cell replacement. SOMATIC BODY CELLS for the purpose of this presentation are the working cells of the body: neurons, glia, red blood cells, immune system cells, muscle cells, skin cells, liver cells, thyroid epithelial cells, heart cells, etc. etc. – excluding stem and progenitor cells. ADULT STEM CELLS can differentiate on an as-needed basis to make replacement SOMATIC BODY CELLS or PROGENITOR CELLS, and they do this throughout a lifetime. ADULT STEM CELLS come in different varieties, such as hematopoietic stem cells which are found in the bone marrow and give rise to all the blood cell types and neural stem cells which give birth to new neurons in the brain and other parts of the body and other related nerve-associated cells like astrocytes and oligodendrocytes. Typically, ADULT STEM CELLS in any category can differentiate into a limited number of target BODY SOMATIC CELL types. They divide like all other cell types and can also morph into PROGENITOR CELLS and SOMATIC BODY CELLS in response to signaling. ADULT STEM CELLS tend to live in stem cell niches which care for them and function like storehouses. Adult stem cells may remain quiescent (non-differentiating although dividing) for substantial periods of time until they are activated by a normal need for more cells to maintain tissues, or by an emergency need induced by disease or tissue injury(ref). The storehouses are always ready to replenish SOMATIC BODY CELLS – that is, as long as a supply of quality ADULT STEM CELLS still exists. PROGENITOR CELLS are ones intermediate in their range of target differentiation capability between ADULT STEM CELLS and SOMATIC BODY CELLS. They tend to be more specific in what they can differentiate into. 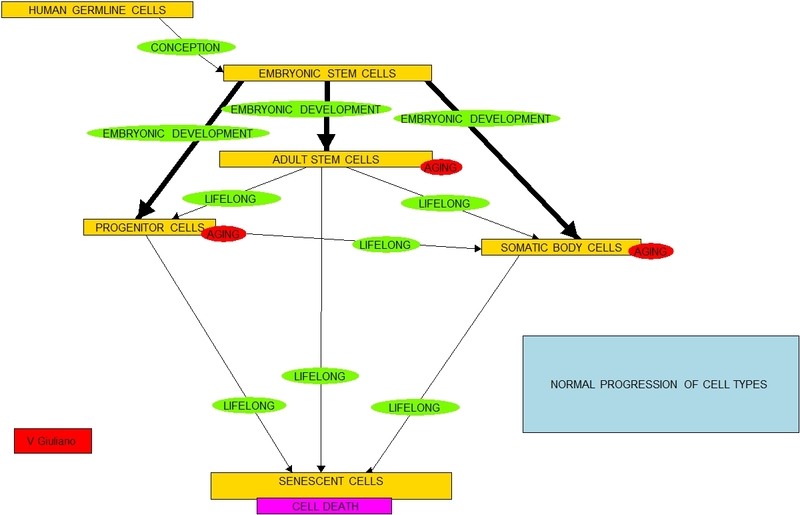 For some cell types there is a hierarchy of progenitor cell types and some PROGENITOR CELLS are short-lived intermediates created in the process of differentiation of ADULT STEM CELLS into SOMATIC BODY CELLS. For simplicity of presentation I have shown them as a single box in the diagram although their properties vary widely. 1. In us humans and other mammals, renewal of our SOMATIC BODY CELLS through differentiation of ADULT STEM CELLS and PROGENITOR CELLS is required throughout life. In the course of a year, virtually all of our blood cells turn over. If ADULT STEM CELL and PROGENITOR CELL differentiation were to stop, we would soon die. No problem during most of normal life, as long as the stocks of ADULT STEM CELLS and PROGENITOR CELLS are plentiful and the cells are young enough that they will readily differentiate. With advanced aging, those conditions may no longer exist. Disease and death may follow. 2. Cells in all of these three categories (ADULT STEM CELLS, PROGENITOR CELLS and SOMATIC BODY CELLS) age with progressive cell divisions. That is: a) there are major shifts in their global gene expression patterns ; hundreds if not thousands of genes get upregulated or downregulated, b) their telomeres (caps at the ends of chromosomes) generally get shorter, c) there are multiple changes in the epigenome, i.e. methylation of promoter regions of genes and changes in histone (spools around which DNA is wrapped) acetylation and histone morphology, and d) once a critical number of replications occur the cells become senescent or dysfunctional or destroy themselves or turn cancerous. 3. With aging ADULT STEM CELLS and PROGENITOR CELLS become less ready to differentiate resulting in the stream of renewal for SOMATIC BODY CELLS slowing down and also the resulting replacement cells being epigenetically older. As cell renewal slows down and the number of senescent cells increases, so does organ renewal slow down or become impaired and disease susceptibility increases. The processes shows up as what we normally call aging and accelerates as the years roll on. Eventually life cannot be sustained and the organism dies. 4. The process is once-through in nature, as is life as we know it. All our cells age and there is nothing in place to keep them young. Up to this point aging has been absolutely insurmountable. But we may be able to change that. The second diagram is the same as the first with additional boxes overlaid and shaded in orange showing the possible longevity intervention. I have described the intervention in previous blog entries(ref)(ref)(ref) but will repeat it here with reference to the diagram. The first step is to COLLECT A SMALL SAMPLE of SOMATIC BODY CELLS from an individual of any age, perhaps in a drop of blood perhaps in a tiny scraping of skin. All of us have experienced collection of such samples. The next step is to CORRECT THE COLLECTED CELLS FOR GENETIC DEFECTS. This is now a fairly well-understood procedure(ref)(ref). Any mutated genes that confer disease susceptibilities is snipped out of the DNA and a healthy versions of the same gene is re-inserted in its place. See the blog entry Treating genetic diseases with corrected induced pluripotent stem cells.An option is to perform the last two steps in reverse order. Also, at either stage the number of cells could be multiplied by standard laboratory processes. The next step is REVERSION TO IPSC STATUS, that is, reversion of the collected corrected cells to being induced pluripotent stem cells. Using one of a number of known approaches, the cells are reverted to being undifferentiated cells that are, apart from correction for damaging genetic mutations, functionally, genetically and immunologically equivalent to the original EMBRYONIC STEM CELLS for the donor of the tissue sample. Reversion to iPSCs is an exciting stream of technology development that has been underway 3-4 years now. See the recent blog entry A breakthrough in producing high-fidelity induced pluripotent stem cells. A key point is that the iPSC cells at this point are young cells like the original EMBRYONIC STEM CELLS. It the reversion job is done right they no longer have any of the markers of aging that were associated with the cells they were made from. This is “the fountain of youth” on the cellular level. The next step is to INDUCE DIFFERENTIATION INTO ADULT STEM CELLS. Much research has been going on oriented to direction of differentiation of pluripotent cells (hESCs or iPSCs) into specific cell types. Research has shown that such pluripotent cells can be directed to become motor neurons(ref), dopaminergic neuronal subtypes(ref), functional dendritic cells(ref), functional hepatic cells(ref), thyroid follicular cells(ref), chondrocytes(ref), glial, and pancreatic endocrine cells(ref), and many other cell types. While most research has been concerned with direct differentiation into SOMATIC BODY CELLS there should be no barrier in principle to inducing differentiation into ADULT STEM CELL and PROGENITOR CELL types. “The most advanced directed differentiation pathways have been developed for neural cells and cardiac muscle cells, but many other cell types including haematopoietic progenitors, endothelial cells, lung alveoli, keratinocytes, pigmented retinal epithelium, neural crest cells and motor neurones, hepatic progenitors and cells that have some markers of gut tissue and pancreatic cells have been produced(ref).” Note that the thus-derived ADULT STEM CELLS, being derived from young iPSC cells will also be young cells. The final step of the process is INTRODUCTION INTO ADULT STEM CELL NICHES of these young adult stem cells into the same individual that provided the sample. The idea is to create introduction of each type of ADULT STEM CELL into its respective niches. I do not know how easy this will be. We do know the places where several types of adult stem cells reside like in bone marrow and in vascular niches. It may be that adult stem cells will more or less know on their own where to go if introduced into the general vicinity of a niche. We do know, for example, that nerve stem cells introduced in the vicinity of damaged nerve tissue will go to that tissue and forthwith start to repair it. An important thing we also know is that the young ADULT STEM CELLS will not generate an immune rejection because they are rejuvenated versions of the original donor’s own cells, immunologically identical. Further research will be required on how best to achieve this step. My intuition says it is achievable. As can be seen in the diagram, what was a once-through process of aging now is supplemented by a closed-loop process of rejuvenation. 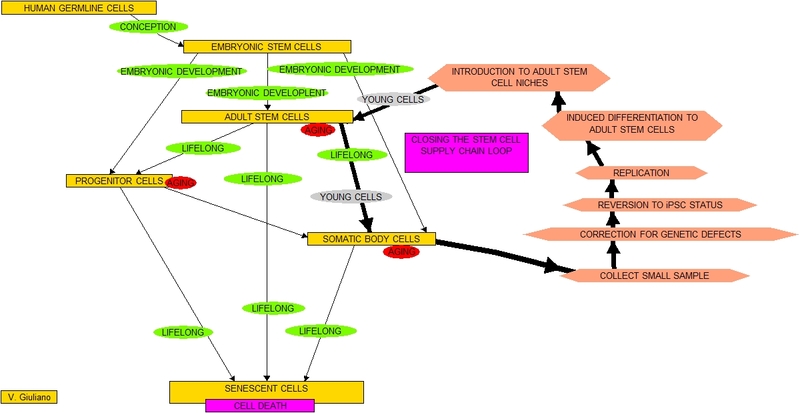 The ADULT STEM CELLS introduced in the steps highlighted in orange are young and when they differentiate into SOMATIC BODY CELLS, those cells will by young too. Periodic rejuvenation created by use of this process could be repeated to keep a person young, perhaps if is repeated every ten years. Could the process enable breaking through the historical limit of 123years for human lifespans? Could it enable lifespans of hundreds of years? I don’t know but of all the proposed longevity interventions I am aware of, I think this one provides the best shot. Every scientist in history has been hampered by not knowing what he does not know, that is, being completely ignorant of and oblivious to important knowledge that emerges later. And, the same is true for me with regard to the longevity intervention I am proposing and what I write. At present I see no reason in principle for why closing the loop in the stem cell supply chain could not work. But the proof will be in the doing. I am optimistic because of the rapid progress I am seeing in the science and practice of each step of the process that I have proposed. Most of the current research on application of iPSCs is in the field of regenerative medicine is aimed at correcting genetic disease-causing defects or at treatment of diseases. While the research is not specifically aimed at longevity, much of the detailed technical knowledge acquired should be applicable to making real the longevity intervention described here. For research background for closing the loop in the stem cell supply chain as a proposed longevity intervention, please see the November 13, 2010 listing of past blog postings on stem cells and epigenetics. I propose an amendment and that is that prior to injecting the altered stem cells that they be given improved mitochondria, say, bird mitochondria with all the benefits thus promoting an improvement in derived cells in terms of energy and less amage to the surrounding system. A very interesting suggestion and one that could conceivably work out well. Clearly, experimentation with with mice and pigs and perhaps other primates would have to come first to see what the whole-body impacts of such mitochondria with high metabolic rates would be. It would seem to me,for example, that evolution would optimize bird mitochondria for providing long bursts of energy during flights, but not necessarily for longevity. In many cases comparing species, there seems to be an inverse relationship between rate of metabolic activity in members of a species and their longevity. On the other hand, there are some long-lived birds like Storm Petrels. We shall see. I want to start by thanking you for composing and maintaining your research and this website/blog. it is the best resource i have found for those of us interested in such things. Re this post. I anticipate the day we can do this. Unfortunately for those of us already aging it may not be possible for us for two reasons. First, for iPSCs in general, there is some concern over their true pluripotency especially when derived from somatic cells. You are likely aware that they are not epigenetically identical to ESCs, especially at imprinted loci, and show preference for differentiating into their tissue from which they were derived. This includes, i believe, reversals from directed differentiation to tissue of origin, in vitro at least. I cannot recall literature that demonstrates the functional consequences of these differences in terms of stem cell therapy in vivo. However, i would not want iPSC differentiated neurons derived from a mesechymal related origin – cancer waiting to happen. Second, somatic cells derived from an aging individual would contain numerous genetic defects (as you mention) but importantly the population from which you choose to expand the cells would contain both the same core mutations inherited from the aging stem cells from which they are derived and also unique mutations due to stochastic events in each cell. These events include random mutation, environmental insults as well as transposition events. The latter has recently been shown to be especially prevalent in neurons. This makes fixing their genetics tricky because they all have different defects. Additionally, it may not be clear which changes are harmful. Furthermore, sequencing one cell destroys that cell and tells you nothing about the other cells’ stochastic mutations. Population sequencing provides the stem cell derived mutations and an idea of the stochastic mutations present in this population. Finally, without an unmutated template of your DNA for comparison, identifying functionally detrimental mutations such as SNPs and transposition events would be difficult. The key may be to harvest stem cells very early on in life, establish genetic and epigentic blueprints for these cells and than expand them as needed throughout life. Eventually however one may need to start repairing those cells too. It will take some time. VG Thanks, I am doing my best though as the volume of literature swells it is getting tougher and tougher to keep up. And thanks to you for these very insightful and highly relevant comments. VG Yes these indeed are concerns with literature coverage of these issues sometimes contradictory, partial or, as you point out, so far absent. I suspect that there are major differences between iPSC lines produced so far by different research groups, possibly depending on transcription factors and specific transduction production processes used and even cell types of origin. I have seen reports that telomeres are very short in one iPSC line and that are long in another line, for example. And there has been the persistent problems of DNA contamination by viral vector residues and inefficiency of transduction processes. However the last three years has seen continuing and accelerating efforts to get truly pluripotent â€œpureâ€ iPSCs, to improve the efficiency of the transduction process, and at least the beginnings of studying the epigentiics of these cells. There is a long ways to go but the intensity of relevant research continues to ramp up. Second, somatic cells derived from an aging individual would contain numerous genetic defects (as you mention) but importantly the population from which you choose to expand the cells would contain both the same core mutations inherited from the aging stem cells from which they are derived and also unique mutations due to stochastic events in each cell. These events include random mutation, environmental insults as well as transposition events. The latter has recently been shown to be especially prevalent in neurons. VG On this issue I am unclear. Certainly, aged somatic cells would continue to have inherited mutations but I am unsure as to how serious the problem of stochastic genetic damage associated with aging is, possibly because I am unfamiliar with the research. There is one theory that DNA methylation associated with aging creates genetic damage in a stochastic manner. See the blog post http://anti-agingfirewalls.com/2009/10/26/homicide-by-dna-methylation/ But I am unsure of how seriously this theory should be taken. On the other hand, stochastic epigenetic events probably do play a role in aging as outlined in my recent blog entry http://anti-agingfirewalls.com/2010/12/06/stochastic-epigenetic-evolution-a-new-and-different-theory-of-evolution-aging-and-disease-susceptibility/ On the other hand, I would expect that cell reversion to iPSC status should clear out such epigenetic changes. I would appreciate any literature citations you could suggest on these topics. This makes fixing their genetics tricky because they all have different defects. Additionally, it may not be clear which changes are harmful. Furthermore, sequencing one cell destroys that cell and tells you nothing about the other cells’ stochastic mutations. Population sequencing provides the stem cell derived mutations and an idea of the stochastic mutations present in this population. VG Yes, I think population sequencing will have to be used. Finally, without an unmutated template of your DNA for comparison, identifying functionally detrimental mutations such as SNPs and transposition events would be difficult. VG For now we would have to depend on SNPs and transposition events that are known to have disease associations via large association studies. In the far future I suppose, DNA samples could be taken at birth or even in the fetal stage to get relatively unmutated DNA templates. Again, I am unclear now as to how serious the issue of age-related gene mutations is. VG This could well be. Even now, some parents are having hESCs from their newborns gathered and stored for future use. And as you point out it could take some time to resolve all these issues. We live in exciting times of discovery. I changed my numbers at the last minute only to regret it. The number of mutations per diploid genome replicated semi-conservatively is double what i reported, assuming unrepaired mismatches. 30,000 – 3000 per 3 billion bases. two stands are newly synthesized, so the numbers are 60,000 – 6000. The number doubles again if mismatches are “repaired” to the template of the mutated base or division occurs again without any further mutations. Thanks for the prompt and highly informative and relevant replies. I have checked out your citations regarding epigenetics of iPSCs and found several more and have to conclude you are absolutely correct about what you say as to the almost but not-quite equivalence of iPSCs to hESCs with respect to epigenetics, propensity to cell fates and other key matters. Most of the publications of relevance were in 2010 and for some reason, busy with other matters I missed them. I will probably generate a blog entry expanding on your points. With regard to your other issue, stochastic mutations as a source of aging, you indeed have something important to say there too. Before getting into that, however, I would like to correspond with you a bit offline from this blog. I could not find registration or e-mail information for you. Would you mind sending me your e-mail address to vegiuliano@comcast.net and I will tell you what I have in mind. Be sure to identify yourself as the mysterious but extremely well informed and responsible communicator B! Wonderful Information — I am working at the present time for Luksus Cosmetics with Dr. Lili Fan. She has been working with peptides for the last 16 year and discovered a revolutionary advancement in the skin care industry. Her product formulation reconizes gene expression and stimulates a human’s own stem cells to promote and correct cell poliferation . Please view her website (www.luksuscosmetics.com) and if you would like you may call the office and speak to her personally. This is a huge advancement in the skin care industry! Loved your article.